Why Use A Litter Box Attractant? The purpose of using a litter box attractant is to help lure your kitty to the litter box. Litter box avoidance is surprisingly common and is a problem for many cat owners. As we know, cats decide what they want to do and when they want to do it but heck, with all of our evolutionary powers we must have some control over a cat. Yes? Maybe? Doubtful? No? Are you confused between litter box attractant and cat attract litter? Why Do Some Cats Poop Or Pee Outside The Litter Box? The last thing you want to find, is a little surprise that is not actually in the litter box. When it happens day after day, night after night and you have tried everything, it really is frustrating. As mentioned,​ cat litter box attractant is a powder that is sprinkled on to the top of your usual litter however, there is also litter that contains an attractant component. If you are trying to decide between these two products it would be much easier to begin with the cat litter box attractant as it is ​a simple matter of sprinkling the attractant on top of the litter you are currently using. If the big guns need to come out then then the cat attract litter would be the next step. Cats will pee and poop in the strangest places that only the kitty feels called to, but annoyingly for us, it is not always in the litter box. This can happen to any cat even if they have had an unblemished record regarding litter box use. Here is a checklist to help understand why cats avoid the litter box. It could be a medical issue. Make an appointment to ​visit the vet.​ Eliminating any medical issues will give you peace of mind. Sometimes, even after a medical issue has been dealt with, the stress of dealing with pain from previous attempts at using the litter box might mean that a behavioral problem now exists. Have you changed the brand/type of litter? This would be a fairly obvious issue however sometimes the associated problem is difficult to fix. If you are transitioning to a different litter just try sprinkling some of the new litter on top of the old litter. As kitty gets used to the smaller amounts of the new litter you can gradually transition to replacing old with new. Has the routine changed? Is there a new cat or a new litter box or is the box in a different location? Is your cat declawed? If you have a declawed cat, litter box avoidance is common and a reason that these cats are often taken to shelters. You can help a declawed cat feel comfortable using ​kitty litter suited to declawed cats as explained in this article. Is the litter box sparkling clean? Cats will avoid a litter box that is less than stellar as they ​are such clean animals. Looking after the litter box and keeping it clean is all part of ​owning a cat. Develop a routine that works for you. This article describes in detail how to look after a litter box. We have already determined that the problem can be medical and/or behavioral. If you have already ruled out medical and your pet detective skills are waning it is worth trying a cat litter box attractant. This product is not used instead of litter, it is added to litter. It is in powder form and is sprinkled onto the top of the litter, just like sprinkling any powder product. An easy fix and definitely worth trying. The 20 oz container will treat 100 lbs of litter. The instructions for use are on the back of the container. The product is all natural however the exact ingredients are not stated. 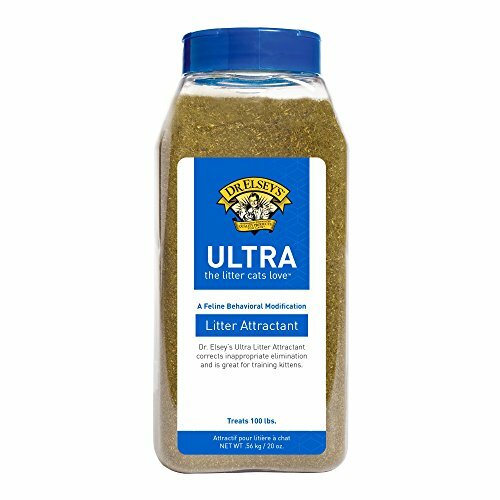 This attractant is for the cat who decides that the litter box is no longer the place to poop or pee and chooses another location such as the living room, the dining room or some other undesirable location. If only we could read kitties mind...(sometimes ignorance is bliss). It would be wise to rule out any medical condition such as a UTI, however, in addition to a medical issue it could also be behavioral, which even if solved can sometimes result in the cat forming a habit of pooping outside the litter box. We form habits that can be hard to break too, so we can't be too hard on kitty. There are in fact a myriad of issues why a cat would avoid a litter box but this product is an excellent way of solving a seemingly impossible problem. Cat abandonment because of litter box avoidance is common. Poor kitty! The solution may be easier than first thought. Be prepared to be patient. Most cats react to the attractant immediately but cats being cats there are always some who may be slower to react. A little bit of patience now will result in big rewards when the problem is solved so it is definitely worthwhile persevering. The product is recommended to be used with unscented clay litter, however it has been used successfully with other types of litter. Ideally use the attractant with unscented litter as the product has its own earthy smell to attract cats and the two scents may be sensory overload. Read here to see how to make the choice between scented or unscented litter. One thing that is worth checking, is the location of the litter box (​the one that the cat is avoiding) and identifying if there are ​scents nearby that may potentially put your cat off using the box. Moving house can can cause litter box avoidance. This cat litter box attractant will help to make kitties transition to a new location much easier. Have some ready to​ go before actual moving ​day so that it is not something you have to think about on ​the day. So if your cat is not peeing in the litter box or your cat is not pooping in the litter box, this is an easy solution that has very good results, is economical and does not require any major changes to the current routine. Previous Post What Is The Best Thing About Using Raised Cat Bowls? Next Post What Is The Answer? Why Do Cats Drink Dirty Water?